Riverside (east) view of the Lazaretto Quarantine Station, 2009. Flip to The Lazaretto Quarantine Station, Tinicum PA, by T. L. Carnea, circa 1840. When this photo was taken in the winter of 2009, the fate of the Lazaretto, the oldest surviving quarantine station in North America, was uncertain. 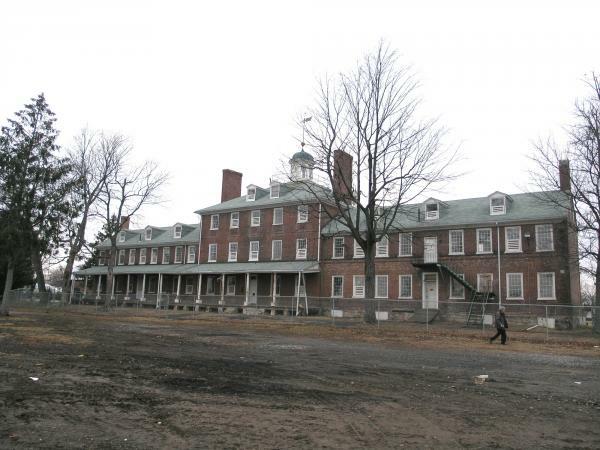 Owned by Tinicum Township, the site was unoccupied and in deteriorating condition. A new fire station, catering hall, and parking lot blocked view of the site from the streets of Essington.